A 37-year-old organization, Conservation Corps North Bay (CCNB) has one simple goal: to engage and empower youth by teaching them to cultivate and preserve the environment. Most of the youth that comprise their corps enter the program without a high school diploma. Some have been incarcerated. Almost all are from extremely low-income households. CCNB provides them with the opportunity to complete high school, access counseling, receive scholarships, work on environmental projects, learn transferable work skills, and take home a paycheck. We’re proud to work with CCNB to support their hard-working youth with energy-providing food necessary to achieve their goals. Believing that equal access to higher education is the key to making positive change within our community, Next Generation Scholars offers a college preparatory curriculum, psychological services, leadership training, and supportive social services to underserved students. For the past 5 years, ExtraFood has been proudly supporting their dedicated scholars with food donations from generous donors throughout Marin County. It is truly a pleasure to work with Director of Family and Community Engagement, Marcia Mata, and the rest of the Next Generation staff to provide their amazing students with the sustenance they need to reach their education goals. The Marin Community Clinics’ twice-weekly health hubs – 2:30-5:30pm on Wednesdays in San Rafael and 2:30-5:30pm on Thursdays in Novato – provide free and bilingual services, such as farmers market style food distribution, zumba, nutrition education, healthy taste tests, health screenings and information about community organizations. We’re proud to deliver healthy food donations to serve their clients at both locations every week. On Wednesdays, we bring produce, dairy, and baked goods from our friends at Nugget Market in Corte Madera to the San Rafael hub. On Thursdays, we bring tasty baked goods from Flour Craft in San Anselmo and beautiful fresh produce from the AIM Civic Center Farmers Market to the Novato hub. It is both humbling and heartwarming to help the Marin Community Clinics serve some of Marin’s most vulnerable residents. Located in Marin City, the People’s Inter-Cities Fellowship (PICF) is a non-denominational, interracial, community-based Christian Fellowship. Food program manager Leticia and her delightful helpers always greet our volunteers with big smiles, open hearts, and generous hugs. PICF acts as a hub for ExtraFood in Southern Marin, serving community members a variety of ExtraFood food donations at their weekly food pantry. We are honored to be working with PICF to extend our reach to Marin City residents in need. Co-developed by Bridge Housing and EAH Housing, Centertown Apartments provides 60 two- and three-bedroom affordable housing units. Located in Central San Rafael, Centertown Apartments is close to public transportation, banks, churches, parks, hospitals, restaurants, the post office, and police and fire departments. We love working with Harriet and Joe – our ever enthusiastic and warm-hearted contacts at Centertown – to bring residents weekly food donations from Marin Coffee Roasters, Wise Sons Bagelry, and Whole Foods on Miller in Mill Valley, and twice-monthly donations from the Mill Valley Farmers Market. Congratulations to our Recipient of the Week, the San Geronimo Community Presbyterian Church! The church, along with our partners at the San Geronimo Valley Community Center, acts as a “hub” for ExtraFood, playing a vital role in helping many individuals and families who struggle with hunger, isolation, and the “food desert” in West Marin. Their team of “Green Apron” volunteers proudly don their green ExtraFood aprons as they pick up and deliver multiple food donations throughout Marin each week. The church has been especially busy this holiday season, staying open to accept food donations every day so that no one has to go hungry over the holidays. A Buckelew Programs program, the Novato Residential Support Services (RSS) offers 24-hour care in homelike settings for clients who need longterm support. Buckelew Programs’ mission is to promote recovery, resilience and hope by providing behavioral health and support services that enhance quality of life. We are honored to deliver to the residents of Novato Residential Support Services weekly food donations from the Novato Safeway on Diablo Ave. Striving for African American health equity, the Marin City Health & Wellness Center provides comprehensive, wraparound care including medical, dental, behavioral health, recovery, midwifery, chiropractic, and nutrition services. Their Friday food pantry serves the “anchor out” and homeless community in the Marin City/Sausalito area. It is such a pleasure to work with pantry leader, Laurie to coordinate weekly food donation deliveries for them from our friends at Philz Coffee and Marin Coffee Roasters. A division of Center Point, Inc., the Women’s Residential Treatment Center is a specialized residential substance use and mental health treatment program designed specifically for women. Clients receive effective, evidence-based, gender-responsive treatment and skill building services in a safe environment where women are treated with dignity and respect. We are honored to support Center Point’s clients with weekly deliveries of individually packaged healthy salads, wraps, sandwiches, juices and more from Byte Foods. Congratulations to our Recipient of the Week, The Phoenix Project of Marin! Formed in 2009, The Phoenix Project is a collaborative community program that provides integrated mentoring and training services for at-risk young males and adults through its Community Connections Center in Marin City. The Phoenix Project received an “Innovation Award” in 2011 from the Department of Housing and Development as an innovative program assisting at-risk youth to better integrate into the community. We are delighted to welcome them to ExtraFood and support their program with tasty weekly food donations from Mulberry Street Pizzeria. An 80-bed shelter for single homeless adults – the largest in the county – Homeward Bound’s New Beginnings Center provides, basic health care, around-the-clock counseling, an on-site 12-step program, relapse prevention workshops, a dining room that serves three meals a day and other services as necessary to help residents move into and maintain long-term housing. Homeward Bound of Marin is a zero tolerance agency. New Beginnings Center provides five on-site vocational training programs: Fresh Starts culinary academy; janitorial and building maintenance; landscaping and garden maintenance; public works, and computer skills classes. We’re honored to support their clients with fresh, healthy food donations throughout the week. Marin Housing Authority’s Homestead Terrace provides 28 studio units to very low income, independent seniors and disabled people in beautiful Mill Valley. We deliver healthy food to them several times a week from our friends at Whole Foods, Mill Valley, AIM Farmers Markets, Wise Sons Bagelry, and Woodlands Markets in Tiburon and Kentfield. It’s always a pleasure to work with Gerrie at Homestead Terrace, who takes such care in receiving and sorting the donations for residents to easily grab whenever they need a quick snack or meal. Located in San Rafael, Marin Services for Men is a community-based, group-oriented, residential setting supporting clean-and-sober living guided by the 12-Step Model. They provide a clean, safe, and nurturing environment combined with the delivery of practical skills and coping strategies for clients to develop and maintain a healthy sense of self. They seek to empower men to take responsibility for their recovery, attain self-reliance, and be of service to others. We’re proud to support their clients with multiple weekly fresh food donations from food donors across Marin. Congratulations to our Recipient of the Week, Marin Family Action! MFA’s mission is to empower low-income families and individuals to actively participate in improving their social and economic quality of life. We deliver a wonderful donation from Nugget Markets’ Novato store to MFA, which is very appreciative of the fresh fruits and vegetables, dairy products, and bakery goods they receive. We’re proud to partner with MFA to serve some of Novato’s most vulnerable residents. Formerly known as Episcopal Senior Communities, Covia promotes positive aging by cultivating healthy and engaged communities with a continuum of innovative services that actively support intellectual, physical, emotional, spiritual, and social well-being. Seniors are a top priority for ExtraFood. It warms our hearts to support the seniors in their program with weekly food deliveries from Panera Bread in San Rafael. JFCS strengthens communities in San Francisco, the Peninsula, Marin, and Sonoma Counties with comprehensive social services for people of all ages, beliefs, and backgrounds. Their high-quality, research-based social services are designed to strengthen individuals, families, and the community. As the problem-solving center for their community, they are a lifeline for children, families, and older adults facing life transitions and personal crises and challenges. We’re proud to support their programs and the people they serve with weekly food donations from San Anselmo Safeway. Since 1954 Whistlestop has promoted the well-bring and quality of life for older adults and people with disabilities in Marin. Their Active Aging Center provides delicious meals, classes, social programs, transportation, referral services, and more. ExtraFood supports Whistlestop’s work to get healthy, affordable home-delivered and onsite meals to those in need. Of the 49,000 people in Marin who worry about where their next meal will come from, over 12,000 are seniors and among ExtraFood’s highest priorities. We’re proud to partner with Whistlestop to serve some of our county’s most vulnerable residents. In partnership with The John Stewart Company, Terra Linda’s Pilgrim Park Apartments provides quality affordable housing and a sense of community to its residents and the nearby neighborhood. The community is enhanced through the general design of its living units (61 apartments), its homework club, summer activities, a Head Start program, the John Starkweather Learning Center, and a community center. It’s our pleasure to bring them regular, hearty donations from Andy’s Market, Marinwood Market, Byte Foods, Novato Safeway on Nave, and Nugget Markets in Corte Madera. A Marin City Limited Equity Housing Cooperative, Ponderosa consists of 56 residential units for low income individuals and families. Residents have access to amenities such as on-site parking, a community room, and a children’s playground. We’re honored to support their residents with weekly donations of fresh, healthy food from food donors across Marin. And the staff is wonderful to work with - always friendly and eager to help our volunteers unload heavy donations. Surrounded by open space with beautiful views of Marin County’s rolling hills, Mackey Terrace provides affordable housing to seniors and persons with physical disabilities in Novato. Residential community building programs include adult classes and programs, access to a community kitchen and lounge area, and an on-site food distribution program. Seniors are a top priority for ExtraFood and we are honored to support the residents of EAH Mackey Terrace with weekly prepared food donation deliveries from the Novato Community Hospital. Led by Pastor Paul Mowry, the Sausalito Presbyterian Church is a progressive and open congregation that embraces the motto “deeds matter more than creeds.” We are honored to support their wonderful Wednesday community lunch program (and their hard-working, dedicated volunteers) with generous donations from Safeway San Anselmo. Downtown Streets Team seeks to end the cycle of homelessness through the dignity of work. Team members begin rebuilding their lives through working on beautification projects. You can often see them at work in their brightly colored team t-shirts in downtown San Rafael. We’re proud to support this wonderful program with deliveries of healthy, fresh food. Bennett House, in sunny Fairfax, is part of the Mercy Housing Group, a nationwide organization that creates stable, vibrant and healthy communities by providing affordable, service-enriched housing for families, seniors, and people with special needs. The senior residents’ enthusiasm and warmth makes Bennett House a favorite stop for our volunteer food runners. Residents at Bennett House look forward to the delicious food donations that arrive from Comforts, Taste Kitchen & Table, the Fairfax Farmers’ Market and College of Marin. Because more than 16,000 seniors in our county can’t make ends meet, seniors are among ExtraFood’s top priorities. We’re delighted to partner with Bennett House to support elders in our community. As part of their community outreach program, St. Stephens participates in the REST program (Rotating Emergency Shelter Team), providing monthly dinners for the hungry from November to April. They also prepare weekly hot lunches for the homeless year-round and run a week-long summer day camp, during which kids from diverse backgrounds and cultures from Marin City and the Canal are taught by professional art educators from local public and private schools. We are honored to help the church in their mission by delivering prepared food donations from The Cheesecake Factory and baked goods and pizzas from Arizmendi Bakery several times a month, as well as additional food donations to support the kids participating in their summer day camp. A Beacon Communities and American Baptist Homes of the West (ABHOW) property, and located in a neighborhood not far from downtown 4th Street, San Rafael Rotary Manor’s 99-unit apartment building offers low-cost and safe housing for seniors. 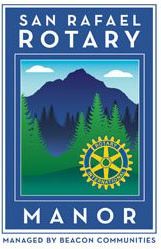 In addition to providing seniors with comfortable apartments, San Rafael Rotary Manor provides easy access to community services and a myriad of activities. The facility was originally a project of Rotary Club of San Rafael and is a testament to the wonderful service of Rotarians throughout our county. We are proud to bring the residents delicious weekly donations from Lotus Cuisine, Byte Foods, Marinwood Market, Nugget Market in Corte Madera, My Thai, and Woodlands Market in Kentfield. Dedicated to eliminating racism, empowering women and promoting peace, justice, freedom and dignity for all, the YWCA offers multiple programs to support women of all ages. Their FiftyPlus job program provides free employment training and job placement service for mature women ready to get back into the workforce. We are proud to support their program with special treats from Safeway San Anslemo for their monthly graduation ceremonies. A Presbyterian Church seminary, SFTS is a founding member of the Graduate Theological Union. Their theology degrees combine classroom learning with immersion in practical ministry, preparing students to bridge theological, cultural, and political divides. We are honored to support their students and their families with donations of healthy, fresh food from produce and shelf-stable foods to prepared grab-and-go meals and snack items. Homeward Bound’s Family Center emergency shelter provides shelter for 9 families at a shared home for up to 6 months. Their services include counseling, support for job and housing search, food assistance, tutoring and help with credit repair or other financial goals. We are honored to support the Family Center with several weekly donations of prepared food, produce, dairy, and baked goods. One of 128 Mercy Housing facilities in California, Martinelli House offers affordable housing for people aged 62 and older. Thousands of Marin seniors are faced with the heart-wrenching decision of using their limited incomes to buy either food or medication. We are proud to help ease that burden and support Martinelli and their senior residents with weekly food donations from M.H. Bread and Butter, Johnny Doughnuts, and Marinwood Market. Formerly known as the Marin AIDS Project, The Spahr Center offers mental health services, a food pantry, housing assistance, advocacy, prevention information and much more to thousands of people living with and affected by HIV/AIDS throughout Marin County. They also offer these services to the LGBTQ community. We are honored to support their important work by contributing to their food pantry with fresh and nutritious donations each week from the San Rafael Whole Foods, Marinwood Market, MH Bread and Butter, Johnny Doughnuts, and Mi Pueblo. Sunny Hills’ TAY is a community-based mental health and substance abuse program whose services include intensive case management, education, employment and medication support for youth ages 16-25. There is also a drop-in center to help with social and independent living skills. We’re delighted to be supporting their young program participants with deliveries of healthy fresh food! The Canal Welcome Center serves San Rafael Canal Community residents, immigrants and low-income families of Marin County in advancing their social, cultural, and economic well being and participating fully in the broader civic life of U.S. society. Presente is a year-round fellowship program that prepares young adults for civic action, community organizing, entrepreneurship, and workplace success. It provides transformational learning that challenges them to be socially responsible, politically aware, and actively engage in issues of the larger community. We are honored to support Presente program participants with twice-weekly donations fromByte Foods. Guiding youth to reach for the stars for nearly 20 years, Performing Stars provides access to professional training in dance, music, social skills and various enrichment opportunities to children who are underserved due to economic, cultural or social barriers. They have helped hundreds of children develop self-esteem and self-reliance and expand their reach for education and social integration by encouraging them to be participants on the inside looking out instead of mere spectators on the outside looking in. We are truly honored to support their program with yummy snacks donated by our friends at Philz Coffee and Peet’s Coffee in Greenbrae. The Marin City Senior Center provides a broad range of individual activities, group activities, and services to enhance and improve the lives of Southern Marin’s elderly population. Programs include senior lunches, transportation services, a computer lab, a grandparents group, a support group for the vision impaired, and other social activities. We are proud to support their Wednesday hot luncheon program with delicious donations from Perry’s in Larkspur, Creekside Pizza & Taproom, and Lotus Cuisine of India. Schurig Center for Brain Injury Recovery provides rehabilitative and support services to improve the quality of life for brain injury survivors and their families while raising community awareness about the causes and effects of this disability. Our weekly donations from Whole Foods in San Rafael, and other spontaneous food donations we deliver support their food program for low-income clients. For over 50 years, Huckleberry Youth Programs has educated, inspired, and supported under-served youth to develop healthy life choices, to maximize their potential, and to realize their dreams. Huckleberry strengthens families and empowers young people with services that promote safety in times of crisis, physical and emotional health and well-being, social justice in communities facing inequality, and educational success. ExtraFood is proud to partner with Huckleberry to provide healthy food to serve their clients in need. Located in Tiburon, EAH Housing’s Hilarita Apartments provides affordable housing for low-income families and the elderly in one- to four- bedroom apartments. We are proud to support their residents with weekly produce, dairy and bakery donations from our friends at Woodlands Market in Tiburon and Nugget Markets in Corte Madera. An EAH Housing family housing community in Mill Valley, Shelter Hill provides family housing and community services – such as after school tutoring – for low-income residents. We‘re honored to support their residents with weekly deliveries of produce, baked goods, and shelf-stable food. A Marin Housing Authority complex, Kruger Pines offers housing in 56 units for low-income seniors and disabled residents. We’re honored to be bringing their residents special treats from our friends at SusieCakes three times a month. Located at Pickleweed Park & Albert J. Boro Community Center in the Canal district of San Rafael, CCCFS provides educational assistance and enrichment activities that support the cultural, physical, social and cognitive development of youth in the Canal area. The majority of children served come from families who are struggling with poverty and limited English. We’re proud to provide them with bi-weekly deliveries of baked goods to support the children and families they serve. Located in Terra Linda, Maria B. Freitas offers 61 affordable low-income housing apartments and a variety of resident services. Mercy Housing, one of the nation’s largest non-profit affordable housing organizations serving low-income families, seniors, individuals and people with special needs, manages the community. We’re delighted to be partnering with Mercy Housing and Maria B. Freitas to help alleviate senior hunger, one of ExtraFood’s top priorities. Changing lives, connecting community: Center Point provides comprehensive social, educational, vocational, medical, psychological, housing, and rehabilitation services to combat social problems such as substance abuse, poverty, unemployment and homelessness. Since they started partnering with ExtraFood in January 2015, Center Point has provided more than 23,000 pounds of donated food to their clients. We are pleased to be able to provide nutritious ingredients, meals, and snacks to support the wonderful work their chef Greg and the rest of the Center Point staff does for our community. Celebrating 45 years of service, North Marin Community Services serves over 4,800 youth, adults and families across 3 program areas, including the recently merged Novato Youth Center and Novato Human Needs. Their programs empower members of our diverse community to achieve well-being, growth and success. We’ve been supporting their programs with food donations since 2016 and look forward to continuing our partnership to serve our community members in need. The San Geronimo Presbyterian Church, along with our partners at the San Geronimo Valley Community Center, acts as a “hub” for ExtraFood, playing a vital role in helping many individuals and families who struggle with hunger, isolation, and the “food desert” in West Marin. Their team of “Green Apron” volunteers proudly don their green ExtraFood aprons as they pick up multiple food donations throughout Marin each week and deliver them to the church for their food pantries and other community service-oriented events. We have been proudly supporting the church and the community they serve since 2014. An Eden Housing property managed in partnership with Homeward Bound of Marin and Marin County Community Mental Health, Fireside has 50 units and a community center for lower income seniors, families, and individuals with special needs. Twenty units provide affordable housing specifically for families and seniors with special needs or who are transitioning from homelessness. Homeward Bound provides ongoing support services for all residents. We are thrilled to bring Fireside’s residents delicious donations every week from our friends at Arizmendi Bakery, MH Bread and Butter, and the Thursday AIM Farmers Market. A Homeward Bound of Marin facility, the Mill Street Center has been working with us since our very first week of operation—providing a critically important service to homeless men and women as the only night-to-night emergency shelter in Marin county. This program has helped so many individuals in our county find a safe, warm, and dry place to spend the night. We’re delighted to support them with regular food donations from the Mill Valley Farmers Market, Los Moles, Kaiser Permanente, Nugget Market in Corte Madera, and Johnny Doughnuts, as well as additional occasional donations to meet their food needs. We’re honored to work with the Mill Street Center! Located in Point Reyes Station, EAH Housing’s Walnut Place provides housing for low-income and disabled seniors in 25 residential units. Residents are offered an array of community-building opportunities including access to a community garden, large community room, and library, as well as a weekly community lunch and exercise class. We are proud to support their residents with fresh, healthy food donations from our generous Marin-based food donors. SGVCC promotes health and wellness to West Marin’s San Geronimo and Nicasio Valley communities by providing valuable resources that support residents in need. This includes a weekly emergency food pantry, health days, educational programs, and a variety of services for seniors. Our volunteers so enjoy making the beautiful drive out to San Geronimo to support their programs and to help our neighbors in need. SGVCC is a treasured resource for the West Marin community! An Eden Housing residence in Novato with programs created in partnership with Homeward Bound of Marin, Warner Creek Senior Housing has 60 1-bedroom units for very low to extremely low-income seniors. Residents living at Warner Creek have access to a supportive resident services program designed to help them to “age in place” and live independently for as long as possible. Warner Creek also includes 22 units targeted to seniors with long-term chronic health conditions or other physical disabilities. We love working with Services & Activities Coordinator, Monina, and her team of volunteer residents! The Novato Youth Center inspires and prepares local youth to succeed by supporting their development in academics and learning; health and well being; personal enrichment through arts and athletics; and social interaction and community engagement. They serve 3,000 youth and their families each year. One-third of their staff is bilingual, so they can serve a culturally and socio-economically diverse mix of families. We’re delighted to be supporting them with weekly food donations from Nugget Markets in Novato and Costco. Located in Marin City, PCIF is a non-denominational, interracial, community-based Christian Fellowship. Food program managers Leticia and Bridget always greet our volunteers with big smiles and open hearts. Says Leticia, “Kids come when their parents aren’t home and they don’t have food in the house. People with babies who live on food stamps come for milk. Seniors who need food at the end of the month when their government benefit checks run out, come for a bag of groceries.” We are honored to be working with PICF to serve our community members in need. Recognizing that people can’t learn if they’re hungry, the College of Marin (COM) set up a “pop-up food pantry” for food-insecure students on their Kentfield campus in partnership with ExtraFood. This program is one of 15 new food programs that ExtraFood has set up with our partners across Marin. We deliver fresh produce and bakery goods to COM every week and we’re delighted to be supporting their incredible work and hard-working students! An important partner for ExtraFood, CAM reaches thousands of people throughout Marin with their programs and services, including serving meals to over 1500 children per day. Their Old Gallinas Children’s Center supports children from low-income working families – ages 11 months to 11 years old – providing academic, arts, and physical education activities. They also provide breakfast, snacks, and lunch to the children, as well as food to support their families. We are proud to bring them delicious baked goods from M.H. Bread and Butter every week. Last year’s winner of the Heart of Marin Award for Excellence in Innovation, Downtown Streets Team seeks to end the cycle of homelessness through the dignity of work. Transitioning team members into employment restores hope and opens the door to other opportunities. Team members begin rebuilding their lives through working on beautification projects. You can often see them at work in their brightly colored team t-shirts in downtown San Rafael. We’re proud to support this wonderful program with deliveries of healthy, fresh food. An 80-bed shelter for single homeless adults – the largest in the county – New Beginnings combines shelter, job training, and work experience opportunities. Their Fresh Starts Culinary Academy welcomes residents and students from the community into a job-training program in their state-of-the-art kitchen. Students intern at the Jackson Cafe in downtown San Rafael, a partnership with Whistlestop, as well as at FSCA’s chef events and in other venues. We have been working with New Beginnings since our very first week of operation and we’re proud to support their work to help people lift themselves out of homelessness. EAH Housing’s Cecilia Place Apartments is a senior community comprised of 16 studio apartments situated in a quiet neighborhood on the scenic Tiburon Peninsula. Our volunteers love stopping by these charming residences every other Sunday to bring the seniors beautiful, fresh produce and baked goods from the Agricultural Institute of Marin’s Sunday Farmers Market. Located in Point Reyes, West Marin Community Services supports programs and services that ensure the well-being of individuals and families in West Marin. Their food pantry serves 70 families in the West Marin “food desert” where residents lack sufficient access to healthy, fresh, affordable food. We are delighted to support their pantry with weekly donations from our generous friends at Safeway in San Anselmo. Gilead House provides transitional housing in Novato for homeless families for up to 12 months. In addition, they provide job skills training, financial management education, parenting coaching, and mentoring for their residents, with the goal of facilitating a successful transition to a stable life and permanent housing. We’re proud to support Gilead’s programming and residents with bi-weekly donations of delicious prepared food from our friends at Beso Bistro. Fulfilling the YMCA’s mission to build strong kids, strong families and strong communities, the YMCA at Hamilton School provides comprehensive afterschool programs to enrich the lives of local children. We are proud to supplement the Y’s child-focused programming with weekly donations of snacks and meals for the children in their care. We’re delighted to recognize the Sausalito Presbyterian Church as our Food Recipient of the Week! Led by Pastor Paul Mowry, the Sausalito Presbyterian Church is a progressive and open congregation that embraces the motto “deeds matter more than creeds.” We are honored to support their wonderful Wednesday community lunch program (and their hard-working, dedicated volunteers) with generous donations from Safeway San Anselmo. A Marin Housing Authority property, Homestead Terrace provides 28 studio units to very low income, independent seniors and disabled people. The smiles on the residents’ faces upon receiving their first food donations from Arizmendi Bakery and All Seasons Catering brought such joy to us all. Jewish Family and Children’s Services (JFCS) is a problem solving center and lifeline for children, families, and older adults facing personal crises or challenges. They offer over 40 programs, including home care for seniors, therapy for children, youth volunteer programs, and services for people with disabilities. JFCS serves people of all faiths, backgrounds and income levels. We are delighted to support their programs with weekly baked goods donations from Safeway San Anselmo and vegetarian meals from Byte Foods. Managed by EAH Housing, Parnow Friendship House is a 72-unit non-profit apartment community in San Rafael. It provides housing for low income seniors 62+, or those under 62 who qualify for the need of an adapted apartment designed for mobility impairments. Resources include classes, shopping trips, computers, and exercise classes. About 2/3 of the residents take advantage of ExtraFood deliveries from Whole Foods San Rafael. SGVCC promotes health and wellness to the San Geronimo and Nicasio Valley communities by providing valuable resources that support residents in need. This includes a weekly, emergency food pantry, health days, educational programs and a variety of services for seniors. The center is grateful for the deliveries of fresh produce, bakery items and prepared food that ExtraFood’s volunteers bring several times each week. SGVCC is a treasured resource for the West Marin community! A BRIDGE Housing property created in partnership with Rotary Club of Terra Linda and the Marin County Redevelopment Agency, this 80-unit low-income housing project in Lucas Valley has been in operation since 1997. Every Sunday, the residents gather together and create a mini food pantry to distribute the produce that we bring them from the Civic Center farmers market. And they are always excited to receive their delicious weekly donation from Bon Appetit Management Company on Thursdays! Episcopal Senior Communities’ Novato Independent Elders Program at the Margaret Todd Senior Center holds workshops, health fairs, multicultural services, and a variety of wellness programs and outreach services, including a food pantry that ExtraFood is delighted to help support. Seniors are top priority for ExtraFood and we’re grateful for NIEP’s partnership as we work together to help seniors age in place with dignity. The Schurig Center offers rehabilitative and support services to help survivors and their families rebuild their lives after a brain injury. Their aim is to improve the quality of life for brain injury survivors and raise community awareness about the causes and effects of this disability. Like a number of our recipient partners, Schurig has created a new food program for their low-income clients with the food from our donations. The Hilarita provides affordable housing for low-income families and the elderly in Tiburon. We are proud to support their residents with weekly produce, dairy and bakery donations from our friends at Nugget Markets in Corte Madera. A Buckelew Program, Helen Vine Recovery Center is a licensed 26-bed co-ed residential detoxification program that provides welcoming, recovery-oriented services to individuals with alcohol and drug addiction issues, as well as co-occurring psychiatric problems. It’s our great pleasure to support this wonderful program with weekly food donations from Byte Foods, Marinwood Market, Starbucks in downtown San Rafael, Terra Linda Safeway, and Arizmendi Bakery. One of 128 Mercy Housing facilities in California, Martinelli House offers affordable housing for persons aged 62 and older. Thousands of Marin seniors are faced with the heart-wrenching decision of using their limited incomes to buy either food or medication. We are proud to help ease that burden and support Martinelli and seniors in our community with weekly food donations from M.H. Bread and Butter, Marinwood Market, and Ponsford’s Place Bakery. The North Bay Children’s Center provides children, including our community’s most vulnerable, with high-quality early learning experiences that build the foundation for healthy productive lives. We are so proud to support NBCC and the children and families they serve with weekly donations of fresh food from our friends at Andy’s Local Market. Located in Novato, Marin Family Action helps low-income community members improve their social and economic quality of life through their Neighborhood Safety Programs. So far, we have delivered to them delicious baked goods from MH Bread and Butter and fresh produce from Whole Foods in San Rafael. We look forward to supporting their empowering programs with more food donations in the future. The Davidson “Clubhouse” serves students from Davidson during the school year and is open to all San Rafael youth ages 6-18 during the summer. Each day they offer a healthy snack and time and space for Club Members to complete their homework during “Power Hour.” They also have a Games Room, Art Room, Lounge, Media Room, and a sports and fitness program. We are delighted to support Boys & Girls Clubs with fresh donations from Nugget Market in Novato and Noah’s Bagels in Greenbrae! Formerly known as the Marin AIDS Project, The Spahr Center offers mental health services, a food pantry, housing assistance, advocacy, prevention information and much more to thousands of people living with and affected by HIV/AIDS throughout Marin County. We are honored to support their important work by contributing to their food pantry with fresh and nutritious donations each week from the San Rafael Whole Foods, Marinwood Market, and MH Bread and Butter. A Homeward Bound of Marin facility, the Family Center emergency shelter provides shelter for 9 families at a shared home for up to 6 months. Family Center services include counseling, support for job and housing search, food assistance, tutoring and help with credit repair or other financial goals. We are honored to support the Family Center with several weekly donations of prepared food, produce, dairy, and baked goods. As part of their community outreach program, St. Stephen’s Episcopal Church participates in the REST program (Rotating Emergency Shelter Team), providing monthly dinners for the hungry from November to April. They also prepare weekly hot lunches for the homeless year-round. We are honored to help the church in their mission by delivering prepared food donations from The Cheesecake Factory and baked goods and pizzas from Arizmendi Bakery several times a month. By providing services and housing in a clean, safe, and supportive environment, Marin Services for Men seeks to improve the quality of the lives of adult men and their families who are adversely affected by dependence on alcohol and/or drugs. A surrogate family structure, guided by the 12-Step Model, helps to empower men to take charge of their recovery, becoming independent, productive members of their families and their community. We are so pleased to work with such an important community organization. Oma Village is a Homeward Bound residential community of modern, green affordable housing in Novato. Oma Village’s services primarily focus on children, with room for tutoring, homework club, and family activities. ExtraFood is proud to support Oma Village in their goal of assisting families to build careers and eventually move into home ownership. One of our newest recipients, Shelter Hill is an EAH Housing family housing community. We recently welcomed them to the ExtraFood family with a generous inaugural donation of delicious baked goods from our friends at Arizmendi Bakery. We are looking forward to providing this wonderful community with additional donations throughout the year. Our Recipient of the Week, Bennett House in sunny Fairfax, is part of the Mercy Housing Group, a nationwide organization that creates stable, vibrant and healthy communities by providing affordable, service-enriched housing for families, seniors, and people with special needs. The senior residents’ enthusiasm and warmth makes Bennett House a favorite stop for our volunteer food runners delivering weekly donations from Comforts and the College of Marin. We are thrilled to welcome Ponderosa Estates to the ExtraFood family as a new food recipient partner and our Recipient of the Week. A Marin City Limited Equity Housing Cooperative, Ponderosa consists of 56 residential units. Our first food delivery was a big one, consisting of baked goods, prepared foods and 100 lbs of meat. Fortunately, the excited residents were ready to accept this generous donation in the newly redecorated room they prepared especially for this addition to their services. Welcome, Ponderosa! Bay Area Community Resources (BACR) provides nurturing and enjoyable afterschool environments for students to improve their academic skills and explore and develop other skills, interests, self-expression, and personal growth using best practices in youth development. They offer structured academic support and enrichment activities for over 150 days during the school year. We are proud to honor this amazing program for its hard work and dedication to the future community builders in its care. Ritter Center‘s mission is to help prevent homelessness and improve the health and well-being of vulnerable members of our county. That is no small task! Providing medical and social services to homeless and low-income individuals and families is a much-needed addition to the lives of those they serve. ExtraFood is honored to assist Ritter Center’s vision of providing exceptional services to the underserved. A Homeward Bound of Marin program since 1987, Voyager Carmel provides short-term (1-4 months) and long-term housing for adults with mental illness. The center includes a 24-hour staff, and a program that focuses on crisis prevention, support to enhance individual strengths, and basic living skills. We’re delighted to be able to assist Voyager Carmel Center with their critically important mission. Located in San Rafael, 10,000 Degrees is devoted to assisting high school and college students from low-income families in their journey to obtain a college degree. One of the many reasons this is critically important: helping one member of a family earn a college degree can break the cycle of poverty. With an 86% college completion rate, 10,000 Degrees is making a big difference in our county and we’re proud to team with them to provide healthy food to their amazing students. Since 1954, Lifehouse has opened the doors of opportunity and independence to individuals with developmental disabilities through life-skills training, community integration, advocacy, referrals and community information. With the help of their staff, donors, volunteers and local community, they strive to improve the quality of life for the people they serve and their families. Since we began working with Lifehouse, they’ve made sure nearly 9000 pounds of rescued food has made its way into the homes of some of Marin’s most vulnerable people. Huckleberry has had a mission of inspiring, educating and supporting youth through the (sometimes difficult!) adolescent years since 1967. That’s 50 years of assisting young people in promoting their ideas, leadership and talents. Huckleberry has programs such as health care and education, crisis shelter, counseling support, and career training. Some of Huckleberry’s clients come from backgrounds with mental health problems, violence, physical and sexual abuse, and pregnancy. These clients are given assistance in navigating the social and justice systems. ExtraFood is proud to partner with Huckleberry to provide healthy food to clients in need. A Homeward Bound of Marin facility, the Mill Street Center has been working with us since our very first week of operation—providing a critically important service to homeless men and women as the only night-to-night emergency shelter in the county. Besides delivering occasional spontaneous donations that match Mill Street’s needs, ExtraFood delivers regular donations of fresh farmers’ market produce and individual prepackaged meals to the great people at Mill Street. This program has helped so many individuals in our county find a safe, warm, and dry place to spend the night. We’re honored to work with the Mill Street Center! Center Point’s mission is to provide comprehensive social, educational, vocational, medical, psychological, housing, and rehabilitation services to combat social problems such as substance abuse, poverty, unemployment and homelessness. Working with ExtraFood, Center Point has already provided more than 2,000 pounds of donated food to their clients this year. We are pleased to be able to provide nutritious ingredients, meals, and snacks to support the wonderful work Center Point does in our community. COM is a community college with two campuses, one in Kentfield and one in in Novato. COM serves many low-income students, and, recognizing that people can’t learn if they’re hungry, worked with ExtraFood to set up a new “pop-up food pantry” on the Kentfield campus, one of 15 new food programs that ExtraFood has set up with our partners across Marin. We deliver fresh produce and bakery goods to COM every week and we’re delighted to be supporting COM’s fabulous work! Located at Pickleweed Park & Albert J. Boro Community Center in the Canal district of San Rafael, CCCFS provides educational assistance and enrichment activities that support the cultural, physical, social and cognitive development of youth in the Canal area. The majority of children served come from families who are struggling with poverty, limited English, and marginalized legal status. We’re delighted to be delivering great donations of fresh produce and baked goods to CCCFS. Sunny Hills’ TAY program is a community-based mental health and substance abuse program whose services include intensive case management, education, employment and medication support for youth ages 16-25. There is also a drop-in center to help with social and independent living skills. We’re delighted to be supporting their program with deliveries of healthy fresh food! Boys & Girls Clubs of Marin and Petaluma serves over 5,300 youth, many of whom are underserved and at-risk. Their mission is to enable all young people, especially those who need it most, to realize their full potential as productive, caring, and responsible citizens. They have multiple afterschool programs including one at the Bayside/Marin Luther King Jr. Academy in Marin City. The Club provides professional staff and volunteers to mentor youth with a formal guidance system, instilling in all of their members a sense of belonging, usefulness, influence and competence. This ambitious project, which won the Heart Of Marin Award this year for Excellence in Innovation, seeks to end the cycle of homelessness through the dignity of work. Team members begin by rebuilding their lives through working on beautification projects. The ultimate goal is to transition these team members into employment because having a job restores hope and opens the door to other opportunities. A key part of their model is educating people and dispelling stereotypes about homelessness. You can often catch a glimpse of team members on the streets in downtown San Rafael, at work in their brightly colored team t-shirts. We’re proud to support them with deliveries of healthy, fresh food! Located in Marin City, this community-based church is a non-denominational, interracial, Bible-Centered Christian Fellowship. Food program managers Leticia and Bridget always greet our volunteers with big smiles and open hearts. Says Leticia, “Kids come when their parents aren’t home and they don’t have food in the house. People with babies who live on food stamps come for milk. Seniors who need food at the end of the month when their government benefit checks run out come for a bag of groceries.” We are honored to be working with PICF to serve those in need. CAM is an important partner for ExtraFood, reaching thousands of people throughout Marin with their services and serving meals to over 1500 children per day. Their Old Gallinas Children’s Center supports 300 low-income families and more than 600 children from 3 months to 13 years old, providing academic, arts, and physical education activities. And they provide breakfast, snacks, and lunch to the kids and support their families with food as well. BACR’s mission is to promote the healthy development of individuals and families, encourage service and volunteerism, and help build community. From time to time we receive a call from Rosa who organizes BACR’s parent education evenings at San Pedro School. Good food is a lure for the parents so Rosa likes to have some available to attract more participants! Our volunteer, Ellie A., was able to bring some extra food from from her Byte Foods pickup on Thursday and it was just the right food for Rosa’s class! SGVCC provides a dynamic center for human services, arts & culture, education, health & wellness and community building, including a variety of food programs. West Marin is a “food desert”— its residents lack sufficient access to fresh, healthy, affordable food — and so is a priority for ExtraFood’s work. We’re delighted to support SGVCC’s food pantry and senior meal program serving those in need in West Marin. NYC’s mission: to inspire and prepare local youth to succeed. They accomplish this by supporting their development in academics and learning; health and well being; personal enrichment through arts and athletics; and social interaction and community engagement. Annually they serve 2,800 youth and their families. One-third of their staff is bilingual, so they can serve a culturally and socio-economically diverse mix of families. We’re delighted to be supporting them with food donations for those in need. Our Recipient of the Week is the New Beginnings Center in Novato. Part of the Homeward Bound of Marin​ family, NBC is an 80-bed shelter for single homeless adults—the largest homeless shelter in the county. It includes the Fresh Starts Culinary Academy, which welcomes residents and low-income students from the community into a job-training program in their state-of-the-art kitchen. Students intern at the Jackson Cafe in downtown San Rafael, a partnership with Whistlestop, as well as at FSCA’s chef events and in other venues. ExtraFood.org has been working with NBC since our very first week of operation 3 years ago, and we’re proud to support their work to help people lift themselves out of homelessness. We’ve been partnering with St Vincent’s, located in downtown San Rafael, since our earliest days. Their Free Dining Room, which was created in 1981 as a free kitchen to serve Marin County’s hungry citizens, has been open every day since then, and has served more than two million meals to date. We deliver a variety of donations to St. Vincent’s, including fresh produce from the Sunday Civic Center Farmers’ Market. We’re proud to support St. Vincent’s important work serving the homeless and those at risk of homelessness. Helen Vine Recovery Center, part of Buckelew Programs, is a licensed 26-bed co-ed residential detoxification program located in San Rafael that provides welcoming, recovery-oriented services to individuals with alcohol and drug addiction issues, as well as co-occurring psychiatric problems. This great program provides a vital “safety net” in our community for individuals with serious mental illnesses and substance use disorders. SGCPC started its thriving food program upon learning they could receive donations from ExtraFood. They serve vulnerable families in the San Geronimo Valley and relay food out to the coast. As a “food desert”—where residents lack sufficient access to healthy, fresh, affordable food—West Marin is one of ExtraFood’s key focus areas and SGCPC is a longtime, terrific partner for us there. Located in central San Rafael, MAP’s mission is to provide the people of Marin County the best quality HIV/AIDS services, information, education and support possible. Every Thursday we bring generous donations from Marinwood Market and Whole Foods Market - San Rafael to their office on Irwin Street. HIV and AIDS continue to be significant issues in our community and ExtraFood.org is delighted to be supporting MAP’s important work. Warner Creek is a property owned and managed by Eden Housing with programs created in partnership with Homeward Bound of Marin. Located in Novato, Warner Creek has 60 1-bedroom units for very low to extremely low-income seniors. Residents living at Warner Creek have access to a supportive resident services program designed to help them “age in place” and live independently for as long as possible. Warner Creek also includes twenty-two units targeted to seniors with long-term chronic health conditions or other physical disabilities. We love working with Monina and her team! 10,000 Degrees aims to achieve educational equity by supporting low-income students to reach their highest potential through achieving a college education. They help these students, through financial aid and individualized counseling, to often become the first in their families to graduate from college. To date, they have helped 18,700 students achieve a college degree! We are delighted to supply food for student meetings at their offices. Marin Services for Men seeks to improve the quality of the lives of adult men and their families who are adversely affected by dependence on alcohol and/or drugs, by providing services and housing in a clean, safe, and supportive environment. Guided by the 12-Step Model, they empower men to take charge of their recovery, becoming independent, productive members of their families and their community. AHO serves Marin’s homeless young adults ages 18-25 and engages youth who have been previously homeless as youth outreach advisors, peer mentors, program advisors, board members and spokespersons of their experience. They help young people connect to AHO’s 25 Alliance for Youth community partners who provide essential services including all aspects of job support, housing, scholarships for education, financial literacy, health care, legal aid, wardrobe and counseling. This week we will be redirecting lots of great food to them for their annual event. A BRIDGE Housing property created in partnership with Rotary Club of Terra Linda and located in rural Lucas Valley, this 80-unit low-income housing project has been in operation since 1997. Every Wednesday the residents look forward to the prepared food from Bon Appétit Management Company. In addition, on Sundays, the seniors are the recipients of fabulous produce from the Sunday Civic Center Farmers’ Market. The Davidson “Clubhouse” serves students from Davidson during the school year and is open to all San Rafael youth ages 6-18 during the summer. Each day they offer a healthy snack and time and space for Club Members to complete their homework during “Power Hour.” They also have a Games Room, Music Lab, Art Room, and a sports and fitness program. We are proud to support Boys & Girls Clubs! Since 1977, CDP had led a comprehensive community effort to end the number one violent crime in Marin County…domestic violence. They provide transformational services and programs that protect and enhance victim safety. They train and coordinate professionals from multiple systems including legal, law, criminal justice, physical and mental heath and education services, ultimately engaging our community in permanent change. We’re proud to support their organization and their clients! This ambitious project seeks to end the cycle of homelessness through the dignity of work. Team members begin by rebuilding their lives through working on beautification projects. The ultimate goal is to transition these team members into employment because having a job restores hope and opens the door to other opportunities. A key part of their model is educating people and dispelling stereotypes about homelessness. You can often catch a glimpse of team members on the streets in downtown San Rafael, at work in their brightly colored team t-shirts. Maria B. Freitas in Terra Linda offers 66 affordable low-income housing apartments and a variety of resident services. They’re part of Mercy Housing, one of the nation’s largest non-profit affordable housing organizations serving low-income families, seniors, individuals and people with special needs. Mercy Housing believes that making the community a better place is just as important as building a home. We’re delighted to be partnering with Mercy Housing and Freitas to alleviate senior hunger, one of ExtraFood’s top priorities. Huckleberry’s mission is “to educate, inspire, and support underserved youth to develop healthy life choices, to maximize their potential, and to realize their dreams.” We provide tasty snacks to Huckleberry such as cupcakes from SusieCakes Bakery, Noah’s Bagels, enchiladas from Marinitas restaurant…anything to keep them studying when the afternoon blahs set in. Voyager Carmel Center became part of the Homeward Bound program in 1987. They provide short-term (1 to 4 months) and long-term housing for adults with mental illness. The center includes a 24-hour staff, a communal kitchen, and a program that focuses on crisis prevention, job readiness, and basic living skills improvement. A wonderful program! Part of Homeward Bound of Marin, the Family Center is the only emergency shelter for homeless families in the county, providing shelter for 9 families for up to 6 months. Activities there include counseling, support for job search and housing search, tutoring, and of course food assistance. Family Center is an important resource in the community and one of the 7 Homeward Bound sites we deliver to. JFCS provides comprehensive services to the entire community including counseling for individuals, couples & families, financial assistance, information & referral, support for people with disabilities, and volunteer opportunities. Each week we deliver produce from the Wednesday Corte Madera Farmers’ Market to JFCS, who distributes the bounty to homebound seniors. St. Stephen’s week-long summer day camp, which begins next week, draws kids from diverse backgrounds and cultures, from Marin City and the Canal, and are taught by professional art educators from local public and private schools. The camp’s emphasis is on the creative arts including painting, drawing, singing, drumming, multi-media and dance. This week we delivered several gallons of milk, yogurt and fruit for the snacks and meals that will be provided to the campers. With a donation from the Marin Farmers Markets on Sunday and Arizmendi San Rafael Bakery & Pizzeria next week, they are well on their way to having the food they need! A Homeward Bound of Marin facility, Mill Street Center has been working with us since our very first week of operation—providing a critically important service to homeless men and women as the only night-to-night emergency shelter in the county. Besides delivering occasional spontaneous donations that match Mill Street’s needs, ExtraFood delivers regular donations of fresh farmers’ market produce and individual prepackaged meals to the great people at Mill Street. Center Point is a residential treatment program in San Rafael, supporting those who are in recovery from drug addiction, trauma, criminal behavior and domestic violence. Their facility serves 3 meals a day for up to 48 people. Their chef, Gregory, has been great to work with and so appreciates the food that we bring to Center Point each week. Hilarita is a 91-unit affordable apartment community in Tiburon with a diverse population of residents consisting of 50% families and 50% seniors. This week, one of their seniors was so delighted to receive our donation, he personally delivered some of the food to homebound seniors there. Mackey Terrace is an EAH Housing property in Novato. EAH Housing was founded in 1968 to address the needs of low-income families and older adults living in Marin. With its success, it has grown, and currently manages affordable housing communities in 50 municipalities in California and Hawaii. Seniors are top priority for ExtraFood’s work, and we’re delighted to be working with Mackey Terrace and EAH. Bennett House is a residence for low-income seniors in Fairfax. They’re part of Mercy Housing, a national, non-profit organization that believes that affordable housing and supportive programs help to transform neighborhoods and improve peoples’ lives. The seniors at Bennett House look forward to their weekly donations from the College of Marin and Comforts Cafe. Ritter Center provides critically-needed services to the homeless and very low income residents of our county: food and clothing, health care, psychotherapy and substance abuse counseling, showers, laundry, restroom facilities, and more—all provided free of charge. Because Ritter does not serve food onsite, we’re delighted to provide “takeaway” food donations that can be easily picked up by their clients. Lifehouse provides high-quality, personalized residential and direct support services to over 200 individuals with developmental disabilities in Marin and Sonoma counties. Lifehouse’s clients live in their own apartment or home, with support services ranging from two hours per week to 24-hour care. We deliver to their main office and from there the food is distributed to their many home sites. We’re proud to partner with such a terrific organization! SparkPoint Marin, a United Way of the Bay Area project located in downtown San Rafael, is a financial education center that helps individuals and families “move from poverty to prosperity.” They do this by providing services such as debt-reduction coaching, budget-management coaching, job training, and support for finding housing. Each week they have an informal food pantry so that when their clients stop in for financial services they can leave with some extra groceries for the week. Many of the clients whom they serve live in the Canal area of San Rafael and this extra food helps with their weekly budgets. SparkPoint is an important community partner for ExtraFood as we work to support all aspects of of the solution to hunger in Marin. Located in Terra Linda, Pilgrim Park provides quality affordable housing—in partnership with The John Stewart Company—and a sense of community for its residents and the neighborhood. Nancy and Margie, the management team, arrange informal food pantries to distribute donations, so we’re able to bring them many types of food…bulk prepared food, produce, dairy and baked goods. They have many seniors living there who particularly appreciate the prepared food we bring them. SGVCC provides a dynamic center for human services, arts & culture, education, health & wellness and community building, including a variety of food programs. West Marin is a “food desert”— its residents lack sufficient access to fresh, healthy, affordable food — and so is a priority for ExtraFood’s work. We’re delighted to support SGVCC’s food pantry and senior meal program. And check out the new film on hunger in Marin, “Hungry in Paradise,” on our website—SGVCC is featured! AHO is an organization designed for youth, by youth, for the future of youth who are homeless or at-risk of homelessness. Since its inception in January 2005, AHO has been leading the way in addressing the growing trend of youth homelessness in Marin County, the Greater Bay Area and Sacramento. We’re delighted to support their youth at their monthly event planning meetings in Marin. Bay Area Community Resources provides the Family Center program at Bahia Vista in the Canal area of San Rafael—a high-priority area for ExtraFood’s work. Parents attend parent meetings, classes and volunteer in the classrooms. Their Wednesday parenting class is held in the evening so parents are able to enjoy a nice meal, which we’re delighted to support. The Marin Community Clinics provide a wide range of primary care and wellness services for adults and children, particularly low-income community members—including the uninsured. The Thursday afternoon HealthHub provides a variety of services for hundreds of clients, including a food pantry, disease screening, medical referrals, nutrition education, and physical activities. Our volunteer, Sarah S., brings produce from the Thursday Civic Center Farmers’ Market to the Health Hub each week. We’re delighted to be supporting MCC’s work on “whole health” by providing them with “fresh from the farm” produce each week. Located in rural Lucas Valley, this 80-unit low-income housing project, created by Bridge Housing in partnership with Rotary Club of Terra Linda and the County of Marin, has been in operation since 1997. Winner of a 1998 Gold Nugget Award for “Best in the West” from the Pacific Coast Builders Conference and an award from the National Council on Senior Aging, Rotary Valley consists of charming one-story bungalow apartments with porches. Every Sunday, the residents gather together and create a mini food pantry to distribute the produce that we bring them from the Civic Center farmers’ market. And they never want to miss their delicious weekly donation that arrives from Bon Appetit Management Company on Thursdays! MSM seeks to improve the quality of the lives of adult men and their families who are adversely affected by dependence on alcohol and/or drugs, by providing services and housing in a clean, safe, and supportive environment. Guided by the 12-Step Model, they empower men to take charge of their recovery, becoming independent, productive members of their families and their community. We’re delighted to welcome MSM to the ExtraFood family! Whistlestop has been helping older adults age with dignity, grace, and independence since 1954. They provide delicious meals, classes, social programs, transportation, referral services, and more. ExtraFood supports Whistlestop’s work to get healthy, affordable home-delivered and onsite meals to those in need. There are as many as 12,000 seniors who can’t make ends meet in Marin, and those seniors are among ExtraFood’s highest priorities. We’re proud to partner with Whistlestop to serve them. Our Recipient of the Week is Gilead House in Novato. They provide transitional housing for homeless families for up to 12 months. In addition, they provide job skills training, financial management education, parenting coaching, and mentoring for their residents, with the goal of facilitating a successful transition to a stable life and permanent housing. We’re honored to support Gilead’s work to help vulnerable people in our community lift themselves out of homelessness. Warner Creek Senior Housing is a property owned and managed by Eden Housing with programs created in partnership with Homeward Bound of Marin. Located in Novato, Warner Creek has 60 1-bedroom units for very low to extremely low-income seniors. Residents living at Warner Creek have access to a supportive resident services program designed to help them “age in place” and live independently for as long as possible. Warner Creek also includes twenty-two units targeted to seniors with long-term chronic health conditions or other physical disabilities. The residents have always been so grateful for their twice-weekly donations of prepared food and Monina, Warner Creek’s Services Coordinator, is a delight to work with! Fireside is a property owned and managed by Eden Housing in partnership with Homeward Bound of Marin and Marin County Community Mental Health. They have 50 affordable family and senior units and a community center for lower income seniors, families, and individuals with special needs. 8 units provide permanent affordable housing for seniors exiting Homeward Bound’s programs, and Homeward Bound provides ongoing support services for all residents. Fireside receives weekly produce from the Civic Center Farmers’ Market as well as baked goods from Arizmendi twice weekly. Bennett House is a residence in Fairfax for low-income seniors and is part of Mercy Housing, a national, non-profit affordable-housing organization. Mercy Housing believes that affordable housing and supportive programs help to transform neighborhoods and improve peoples’ lives; Bennett House so clearly shows Mercy Housing translating that belief into action. Every Friday, the residents at Bennett House look forward to the delicious food donations that arrive from Comforts, Andronico’s and College of Marin. Because up to 12,000 seniors in our county can’t make ends meet, seniors are among ExtraFood’s top priorities. We’re delighted to partner with Bennett House to support elders in our community. Martinelli House provides 66 units of affordable, quality housing in San Rafael to seniors age 62+ and people with disabilities. They’re part of the Mercy Housing Group, a nationwide organization which has participated in the development, preservation and/or financing of more than 45,800 affordable homes. Each week the delightful Mary Mendoza, Martinelli’s resident services manager, greets our volunteers as she receives our deliveries from M.H. Bread & Butter Bakery and Andronico’s. So many seniors in our expensive county live on a low, fixed income and can be faced with deciding between buying food and medication. We’re delighted to be working with Martinelli House to support elders in our community. The Family Center, part of Homeward Bound of Marin, is the only emergency shelter for homeless families in the county, providing shelter for 9 families for up to 6 months. Activities there include counseling, support for job search and housing search, tutoring, and of course food assistance. Family Center is an important resource in the community and one of the 7 Homeward Bound sites we deliver to. We look forward to delivering more food to them and helping to free up the parents (12 adults with 15 kids) on evenings when they are participating in the “house meetings” and unable to cook. Jewish Family and Children Services provides comprehensive services to the entire community including counseling for individuals, couples & families, financial assistance, information & referral, support for people with disabilities, and volunteer opportunities. Each week we deliver baked goods from Bordenave’s and produce from the Wednesday Corte Madera Farmers’ Market to JFCS, who distributes the bounty to homebound seniors. A Homeward Bound of Marin facility, Mill Street Center has been working with us since our very first week of operation— providing a critically important service to homeless men and women as the only night-to-night emergency shelter in the county. Besides delivering occasional spontaneous donations that match Mill Street’s needs, ExtraFood delivers regular donations of fresh farmers’ market produce and individual prepackaged meals. And their staff is always collaborative and friendly with us. Ritter Center offers critically-needed services to the homeless and very low income residents of our county: food and clothing, health care, psychotherapy and substance abuse counseling, showers, laundry, restroom facilities, and more—all provided free of charge. Because Ritter does not serve food onsite, they need food donations that can be easily picked up by their clients—what we call “takeaways”. This week, ExtraFood organized the delivery of 50 boxes of emergency food kits and 25 boxes of high protein “full meal” bars to Ritter Center. St. Stephen’s week-long summer day camp, Camp Create, draws kids from diverse backgrounds from Marin City and the Canal. The camp’s emphasis is on the creative arts including painting, drawing, singing, drumming, multi-media and dance. St. Stephen’s reached out to us and has been thrilled with amazing produce from the Sunday Marin Farmers Markets​, as well as lots of dairy, juice and bread from Corte Madera Nugget Markets​. We hope to be delivering more food to them in the future to supplement their soup kitchen for the homeless. The Marin Community Clinics provide a wide range of primary care and wellness services for adults and children, particularly low-income community members—including the uninsured. The Novato clinic’s amazing Thursday afternoon HealthHub provides a variety of services for hundreds of clients, including a food pantry, disease screening, medical referrals, nutrition education, and physical activities. We’re delighted to be supporting MCC’s work on “whole health” in partnership with many people in our community. Maria B. Freitas Senior Community in San Rafael provides Assisted Living to 65 seniors, enabling them to live as independently as possible while making personal care available as their care needs increase. They’re part of Mercy Housing​, one of the nation’s largest non-profit affordable housing organizations serving low-income families, seniors, individuals and people with special needs. Seniors are a top priority for ExtraFood, with between 9 and 12 thousand living under the self-sufficiency standard in our county. Our Recipient of the Week is the Fireside Apartments, a property owned and managed by Eden Housing and part of a partnership with Homeward Bound of Marin and Marin County Community Mental Health. Fireside has 50 affordable family and senior units and a community center for lower income seniors, families, and individuals with special needs. 8 units provide permanent affordable housing for seniors exiting Homeward Bound’s programs, and Homeward Bound provides ongoing support services for all residents. Seniors are a top priority for ExtraFood—according to the Grand Jury, there are 9,000-12,000 living below the federal poverty level in Marin—and we’re delighted to be supporting Fireside’s work. The Family Center is the only emergency shelter for homeless families in the county, providing shelter for 9 families for up to 6 months. Activities there include counseling, support for job search and housing search, tutoring, and of course food assistance. We want to welcome Tony, their new program director, and we look froward to working with him in his new role. AHO serves Marin’s homeless young adults ages 18-25 and engages youth who have been previously homeless as youth outreach advisors, peer mentors, program advisors, board members and spokespersons of their experience. They help young people connect to AHO’s 25 Alliance for Youth community partners who provide essential services including all aspects of job support, housing, scholarships for education, financial literacy, health care, legal aid, wardrobe and counseling. Check out their Jan 29 event! Ritter Center offers critically-needed services to the homeless and very low income residents of our county: food and clothing, health care, psychotherapy and substance abuse counseling, showers, laundry, restroom facilities, and more—all provided free of charge. Because Ritter does not serve food onsite, they need food donations that can be easily picked up by their clients—what we call “takeaways”: for example, individually wrapped sandwiches and packaged goods such as energy bars. Community Action Marin is an important partner for ExtraFood, reaching thousands of people throughout Marin with their services and serving meals to over 1500 children per day. The Child Development program supports 300 low-income families and over 600 children from 3 months to 13 years old, providing academic, arts, and physical education activities. And they provide breakfast, snacks, and lunch to the kids and support their families with food as well. There are 20,000 seniors 60+ in Marin who are living in poverty, as measured against the Elder Economic Index. 20,000! The average Social Security benefit for seniors in Marin is $12,000/year…not going to cut it. Fortunately, great places like MCJSC help to provide a safety net for our seniors, including a great food program that we are delighted to support. Maria B. Freitas is a senior living community in San Rafael offering Assisted Living to support 65 seniors to live as independently as possible while making personal care available as their care needs increase. ExtraFood will help provide food for their Monday pantry. Maria B. Freitas is part of Mercy Housing, one of the nation’s largest non-profit affordable housing organizations serving low-income families, seniors, individuals and people with special needs. We’re delighted to be working with them.